The Crown is the bedrock of Westminster-style democracies, yet its meanings, powers and effects are opaque and little understood. Edited by Williams, David V.
The Crown stands at the heart of the New Zealand, British, Australian and Canadian constitutions as the ultimate source of legal authority and embodiment of state power. A familiar icon of the Westminster model of government, it is also an enigma. Even constitutional experts struggle to define its attributes and boundaries: who or what is the Crown and how is it embodied? Is it the Queen, the state, the government, a corporation sole or aggregate, a relic of feudal England, a metaphor, or a mask for the operation of executive power? How are its powers exercised? How have the Crowns of different Commonwealth countries developed? 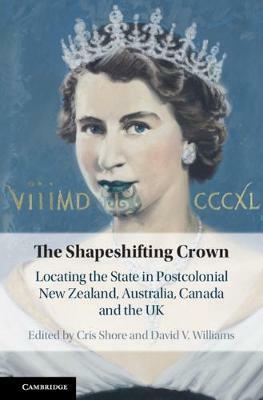 The Shapeshifting Crown combines legal and anthropological perspectives to provide novel insights into the Crown's changing nature and its multiple, ambiguous and contradictory meanings. It sheds new light onto the development of the state in postcolonial societies and constitutional monarchy as a cultural system. Cris Shore is Professor of Anthropology at the University of Auckland and Guest Professor of Public Management at Stockholm University's Centre for Organisational Research. Previously, he was the Head of Department and founding director of the Europe Institute, University of Auckland and taught at Perugia University (1986), Oxford Brookes University (1987-90) and Goldsmiths College (1990-2003). His research specialisms include political anthropology, organisations, higher education, the anthropology of policy, corruption, and Europe. He is author/co-editor of 140 articles and 14 books including Building Europe (2000); Corruption: Anthropological Perspectives (2005); Policy Worlds: Anthropology and the Analysis of Contemporary Power (2011); Up Close and Personal: Peripheral Perspectives and the Production of Anthropological Knowledge (2013) and Death of the Public University? (2017). He has held visiting appointments at the universities of Harvard, Bristol, Aarhus, Sussex, University College London, Malta and the European University Institute, Florence. In 2017, he was awarded the Royal Society of New Zealand's Mason Durie medal for contributions to the social sciences. David V. Williams is a Professor of Law at the University of Auckland. He has taught and researched at the University of Dar es Salaam, Tanzania and then the University of Auckland since 1972. He has been an independent researcher and barrister specialising in research relevant to Treaty of Waitangi claims by indigenous Maori concerning historic acts or omissions of the Crown. He has authored 5 books including 'Te Kooti tango whenua': The Native Land Court 1864-1909 (1999) and A simple nullity? The Wi Parata case in New Zealand Law and History (2011). Additional publications include 18 book chapters, 37 refereed journal articles and 10 major technical reports submitted to the Waitangi Tribunal. He has held visiting appointments at Exeter College, St John's College and Corpus Christi College, University of Oxford, and at the University of Dar es Salaam, Tanzania. In 2017, he was elected an Honorary Fellow of the American Society for Legal History.